Ric Flair and Offset gave us one for the ages. History has been made. When Offset and Metro Boomin first teamed up for Without Warning's most valuable banger "Ric Flair Drip," the idea of a Ric Flair assisted video was merely a fantasy. However, the wrestling legend makes dreams come true. Today, the song has received a second life courtesy of this new and lavish Shomi Patwary directed clip. In true Migos fashion, the team is intent on stunting. And while they no doubt take their lavish lifestyle seriously, the inclusion of Ric Flair gives the otherwise humorless video a much appreciated sense of levity. From the minute he saunters onto the scene, it's evident we're in the presence of greatness. 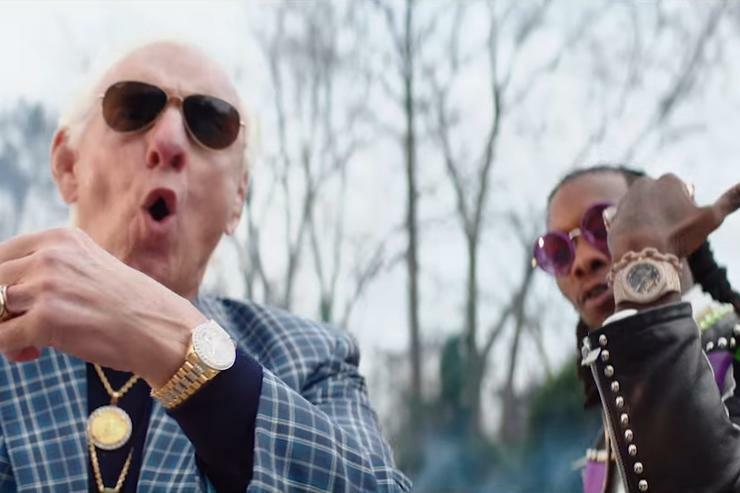 Ric Flair is well suited for the lifestyle perpetuated by Offset, Metro Boomin, and 21 Savage. Perhaps he can even teach the youngsters a lesson or two about proper stunting etiquette. For one, he seems to have a firm grasp on proper grape eating technique. Not to mention dance moves that would make dads worldwide beam with pride. It might be a little strange to see Offset and Ric Flair donning matching attire, but for some reason, it works. The clip is destined to become iconic. Here are some of the most defining moments of "Ric Flair Drip."